Sluggers highlight the 1954 cards in my collection. 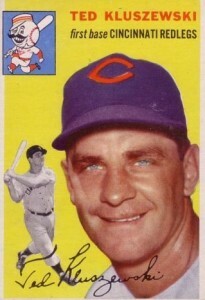 Ted Kluszewski and Al Rosen both won home run crowns. Kluszewski blasted 49 homers in 1954 to win the National League title as he set a team record for the Cincinnati Reds that would stand until George Foster hit 52 in 1977. That year, he would also knock in a 149 runs to lead the majors in both categories in what would be his best season. Starting his career with the Reds in 1947, Kluszewski became a regular at first base the following season. By 1953, he made the all-star team for the first time after hitting 40 homers with 108 RBI. Known for cutting his uniform sleeves to display his bulging biceps, Kluszewski would make the the all-star for the next three years. He the the NL in hits with 192 in 1955 as he hits 47 long balls with 113 RBI. Before the 1958 season, the lefty slugger was traded to the Pittsburgh Pirates. Late in 1959, Kluszewski was sent to the Chicago White Sox and he would appear in his only World Series as a player. As the White Sox fell in six games to the Los Angeles Dodgers, Kluszewski hit three home runs with 10 RBI as he batted .391 in the series. After another season with the White Sox, he finished his career with the Los Angeles Angels in 1961. Kluszewski was inducted into the Reds Hall of Fame in 1962 and his No. 18 was later retired. During the 1970s, Kluszewski served at the hitting coach for Cincinnati’s Big Red Machine. 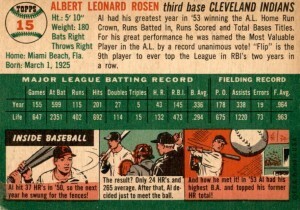 Rosen’s 1954 card has the stats from his greatest season from the previous year when he was named the American League’s Most Valuable Player. That season, he hit 43 homers and had 145 RBI, which were tops in the AL. Like Kluszewski, Rosen made it to the big leagues in 1947. 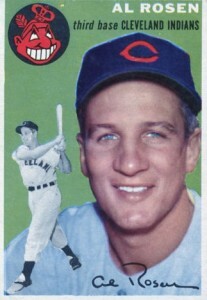 Rosen spent his entire career with the Cleveland Indians until he retired after the 1956 season. Although he was a member of the 1948 Indians that won the World Series, he wasn’t the team’s starting third baseman until 1950. A four-time all-star, Rosen also led the AL in homers in 1950 with 37. He also won his first of two RBI titles in 1952 when he knocked in 105 runs. In 1954 when the Indians won the AL pennant, Rosen was named the MVP of the all-star game as he hit a pair of homers in the contest. By the late 1970s, Rosen became an executive with the New York Yankees as they won the World Series in 1978, He moved on to the Houston Astros and then the San Francisco Giants. Rosen was inducted in the Indians Hall of Fame in 2006.